Posts tagged "flat bed printing"
Flatbed printing is the latest in sign-making technology. Flat bed printing allows Perth Graphics Centre to print onto virtually any clean surface in high resolution and high speed. Using ultra-violet light to cure the outdoor-grade inks, the flat-bed printer prints direct to the substrate making corflute signs, metal signs and plastic signs a quick and easy affair. This is in contrast with the current method of signmaking whereby inks are printed onto vinyl and then the vinyl is applied to the surface. Removing this laborious process allows Perth Graphics Centre to speed up turnaround and to control consistency. Flat bed printing is the next step in Perth Graphics Centre’s expansion to become Perth’s largest and most efficient sign shop. Most sign shops will be still stuck in the dark ages of vinyl cutting and solvent printing, whereas Perth Graphics Centre can now print onto light-coloured surfaces and dark-coloured surfaces with our white-ink option. Acrylic signs, flute signs, PVC signs, banners, aluminium signs – you name it, we can print it. And we’ll print it fast and efficiently. 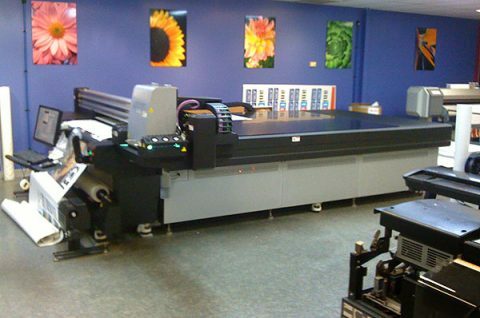 Give us a call to ask for a quote on flat-bed printing today.